People with plenty of a B-vitamin in their blood appear to be at a reduced risk of lung cancer, even if they smoke, a European study suggests. High levels of Vitamin B6 and the amino acid methionine cut the risk by half, a study of 400,000 people suggested. These occur naturally in nuts, fish and meat or can be taken as supplements. But experts told the Journal of the American Medical Association that stopping smoking remained the best way of reducing lung cancer risk. And, as yet, it is too early to say that taking vitamins would provide any extra protection, they say. Higher vitamin levels could simply reflect healthier lifestyles. More studies are needed before scientists can be confident that increasing levels of B-vitamins in the diet can reduce the risk of lung cancer, and also to understand why this might be, says the World Cancer Research Fund (WCRF) which was involved in the research. Dr Panagiota Mitrou, of the WCRF, said: "These findings are really exciting as they are important for understanding the process of lung cancer and could have implications for prevention. "But while this is an important study, it is vital that we get the message across to smokers that increasing intake of B-vitamins is not - and never will be - a substitute for stopping smoking." However, it could mean that ex-smokers and people who have never smoked can do something positive to reduce their risk of lung cancer, she said. The study looked at nearly 400,000 people from 10 European countries over eight years. They included people who had never smoked, current smokers and ex-smokers. Regardless of their smoking status, the people with higher circulating levels of both Vitamin B6 and methionine in their blood appeared to be protected against lung cancer. Far fewer of them developed lung tumours over the course of the study compared with those with the lowest levels of the essential nutrients - 129 people versus 408 respectively, out of a total of 899 cancer cases overall. Dr Paul Brennan, lead researcher of the study from the International Agency for Research on Cancer, said: "If further research does confirm our findings then the next step would be to identify the optimum B-vitamin levels for reducing future cancer risk." Dr Joanna Owens, of Cancer Research UK, said: "Although this study suggests a link between vitamin B levels in the blood and reduced risk of lung cancer, this doesn't prove that vitamin B can directly protect against the disease. "Vitamin B levels might be higher in people who eat a healthy diet, and this in itself can help reduce the risk of cancer. 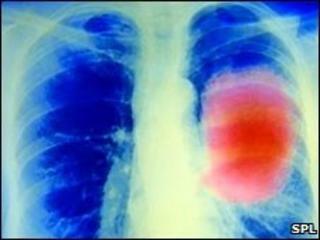 "The most important way to prevent lung cancer is to stop smoking. No amount of vitamins can counteract the risks posed by smoking."